Collins, Joseph B., trans. Catechetical Instructions of St. Thomas Aquinas. Fort Collins: Roman Catholic Books, 1939 reprint. Fathers of the English Dominican Province, trans. Summa Theologiae. NY: Benziger, 1920. Mulligan, Robert W., et al. Library of Living Catholic Thought: Truth, Vols. I-III. Chicago: Henry Regnery, 1952-1954. Rickaby, Joseph, trans. Summa Contra Gentiles. London: Burns & Oates, 1905. Clark, Mary T., ed. An Aquinas Reader. Garden City: Image, 1972. D’Arcy, M.C., ed. Everyman’s Library No. 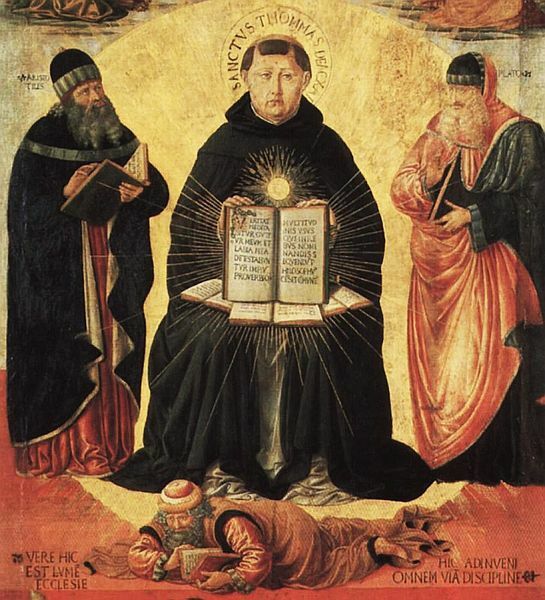 953: Thomas Aquinas, Selected Writings. London: J.M. Dent, 1939. Gilby, Thomas, trans. St. Thomas Aquinas: Theological Texts. London: Oxford, 1955. Pegis, Anton C., ed. Modern Library College Editions: Introduction to Saint Thomas Aquinas. NY: The Modern Library, 1948. _____. The Random House Lifetime Library: Basic Writings of Saint Thomas Aquinas, Vols. I and II. NY: Random House, 1945. Bourke, Vernon J., ed. The Pocket Aquinas. NY: Pocket, 1960. Cessario, Romanus. A Short History of Thomism. Washington, DC: Catholic University of America, 2005. Davies, Brian. Outstanding Christian Thinkers: Aquinas. London: Continuum, 2002. Farrell, Walter. A Companion to the Summa: Vols. I-IV. NY: Sheed & Ward, 1938-1942. Farrell, Walter and Martin J. Healy. My Way of Life: Pocket Edition of St. Thomas, The Summa Simplified for Everyone. Brooklyn: Confraternity of the Precious Blood, 1952. Freeman, Eugene and Joseph Owens. The Wisdom and Ideas of Saint Thomas Aquinas. Greenwich: Fawcett, 1968. Gilson, Etienne. The Christian Philosophy of St. Thomas Aquinas. Notre Dame: University of Notre Dame, 1994. _____. Elements of Christian Philosophy. NY: The New American Library, 1963. Glenn, Paul J. A Tour of the Summa. Rockford: TAN, 1978. Gratch, Edward J. Aquinas’ Summa: An Introduction and Interpretation. NY: Alba, 1985. Grenet, Paul. Thomism: An Introduction. NY: Harper & Row, 1967. Kreeft, Peter. A Shorter Summa: The Most Essential Philosophical Passages of St. Thomas Aquinas’ Summa Theologica, Edited and Explained for Beginners. San Francisco: Ignatius, 1993. _____. A Summa of the Summa: The Essential Philosophical Passages of St. Thomas Aquinas’ Summa Theologica, Edited and Explained for Beginners. San Francisco: Ignatius, 1990. Mayer, Mary Helen. The Philosophy of Teaching of Saint Thomas Aquinas. Harrison: Roman Catholic, 1928 reprint. McInerny, Ralph. St. Thomas Aquinas. Notre Dame: University of Notre Dame, 1982. O’ Donnell, Robert A. Hooked on Philosophy: Thomas Aquinas Made Easy. NY: Alba, 1995. Pieper, Josef. Guide to Thomas Aquinas. San Francisco: Ignatius, 1986. Torrell, Jean-Pierre. Aquinas’s Summa: Background, Structure, & Reception. Washington: Catholic University, 2005.